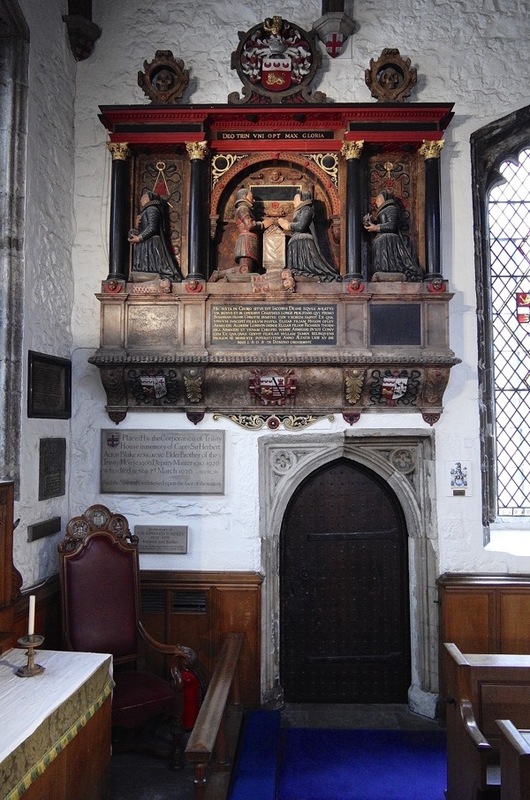 Do you see Elizabeth Pepys, leaning out from her monument and directing her gaze across the church to where Samuel sat in the gallery opposite? These days the gallery has long gone but, since her late husband became celebrated for his journal, a memorial to him was installed in 1883 where the gallery once was, which contains a portrait bust that peers back eternally at Elizabeth. They will always see eye-to-eye even if they are forever separated by the nave. 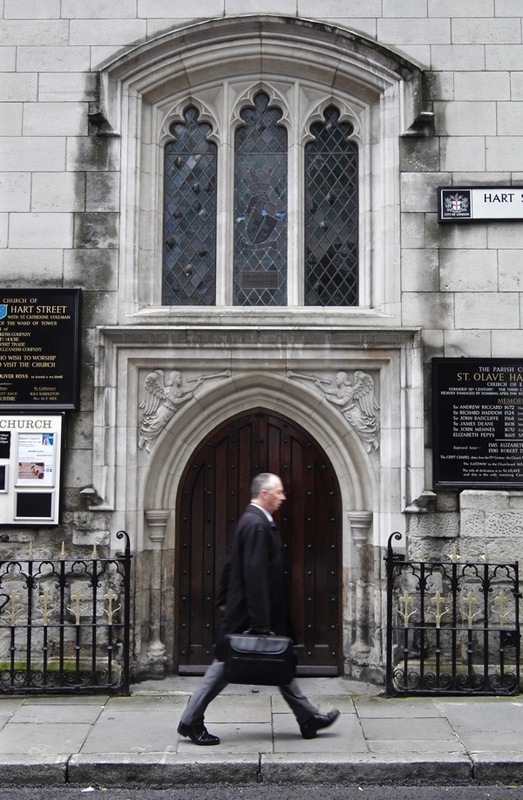 St Olave’s on the corner of Seething Lane has long been one of my favourite City churches. 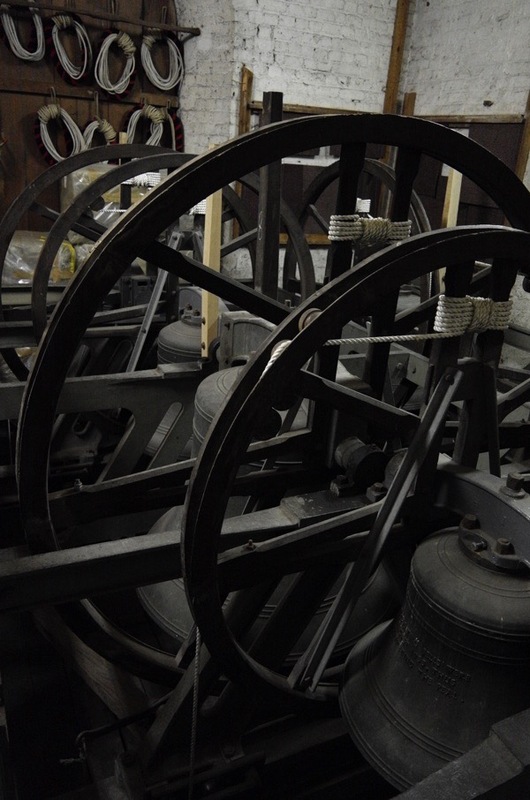 Dating from the eleventh century, it is a rare survivor of the Great Fire and the London Blitz. When you walk in from Hart St, three steps down into the nave immediately reveal you are entering an ancient building, where gothic vaults and medieval monuments conjure an atmosphere more reminiscent of a country church than one in the City of London. 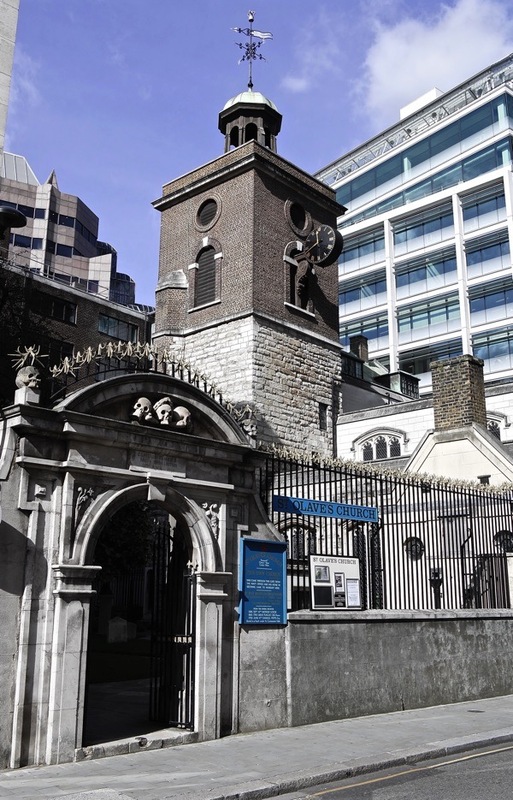 Samuel Pepys moved into this parish when he was appointed Commissioner of the Navy Board and came to live next to the Navy Office at the rear of the church, noting his arrival at “my house in Seething Lane” in his journal on July 18th 1660. 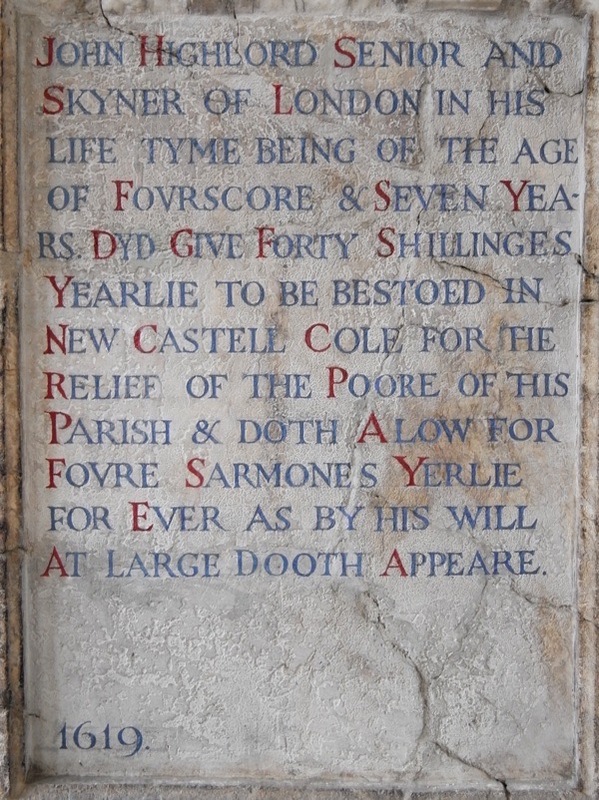 It was here that Pepys recorded the volatile events of the subsequent decade, the Plague and the Fire. 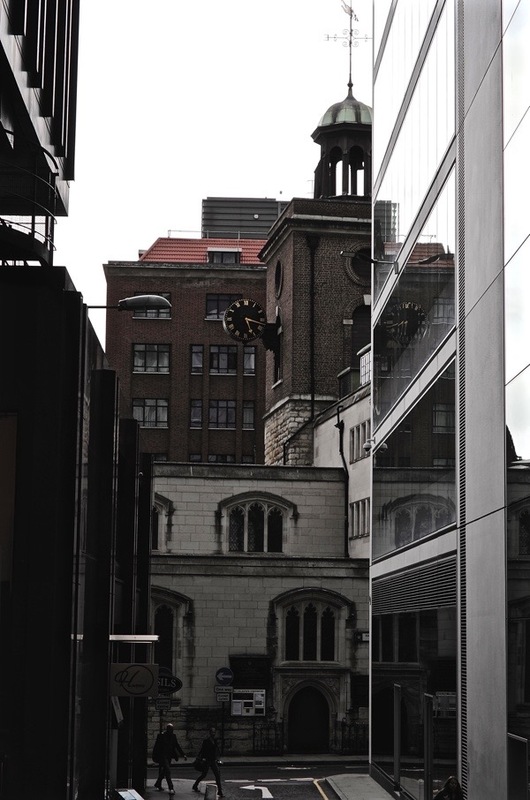 In Seething Lane, a gateway adorned with skulls as memento mori survives from that time. 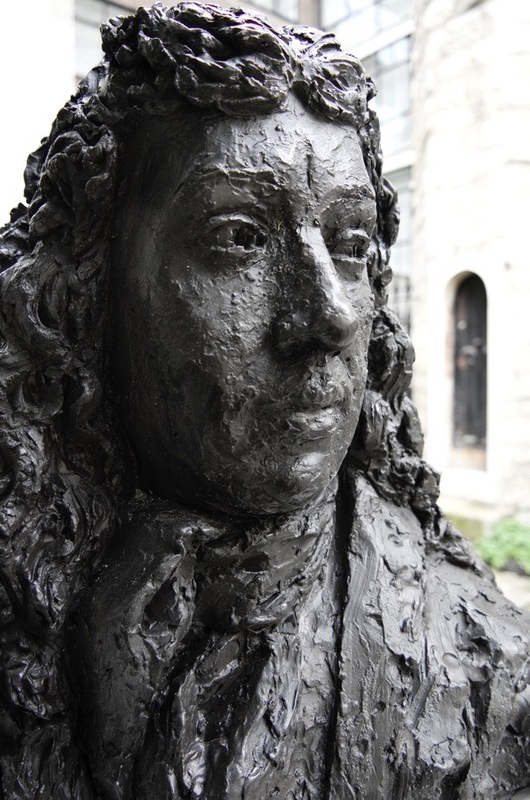 Pepys saw the gate from his house across the road and could walk out of the Navy Office and through it into the churchyard, where an external staircase led him straight into the private Navy Office pew in the gallery. The churchyard itself is swollen above surrounding ground level by the vast number of bodies interred within and, even today, the gardeners constantly unearth human bones. When Elizabeth and the staff of the Navy Office took refuge from the Plague south of the river, Pepys stayed behind in the City. 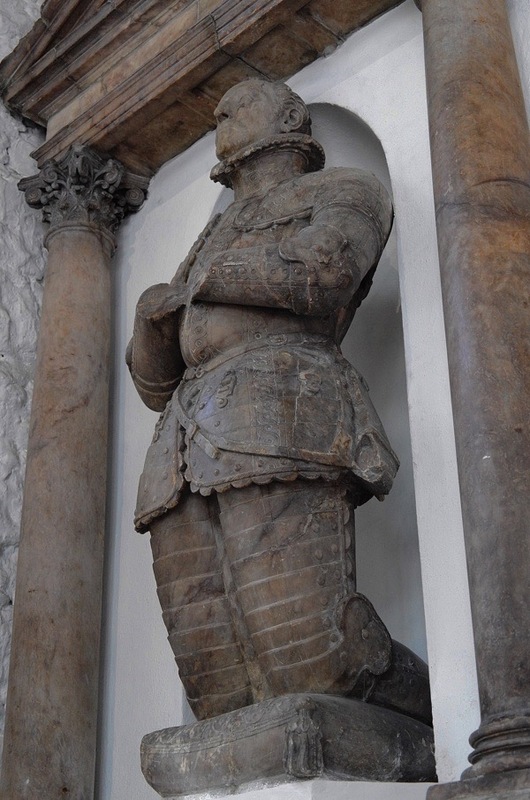 Countless times, he walked back and forth between his house and the Navy Office and St Olave’s as the body count escalated through the summer of 1665. “The sickness in general thickens round us, and particularly upon our neighbourhood,” he wrote to Sir William Coventry in grim resignation. The following year, Pepys employed workers from the dockyard to pull down empty houses surrounding the Navy Office and his own home to create fire breaks. 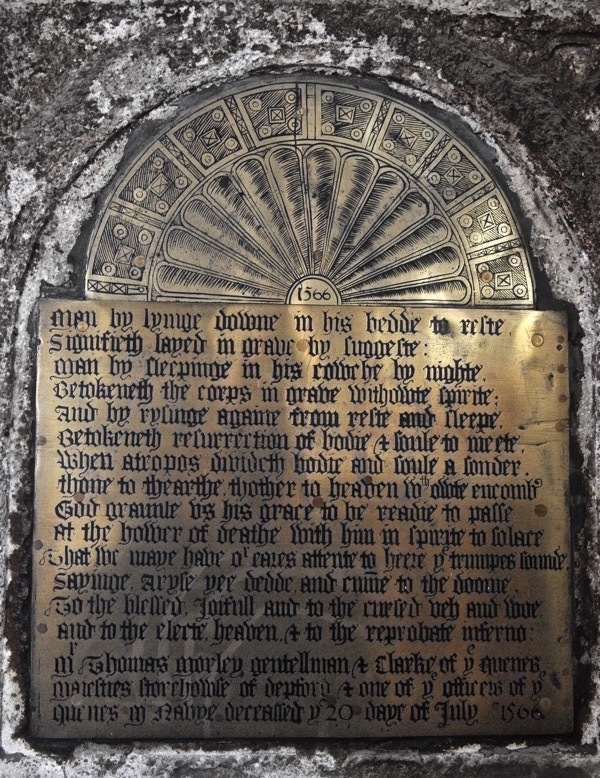 “About 2 in the morning my wife calls me up and tells me of new cries of fire, it being come to … the bottom of our lane,” he recorded on 6th September 1666. 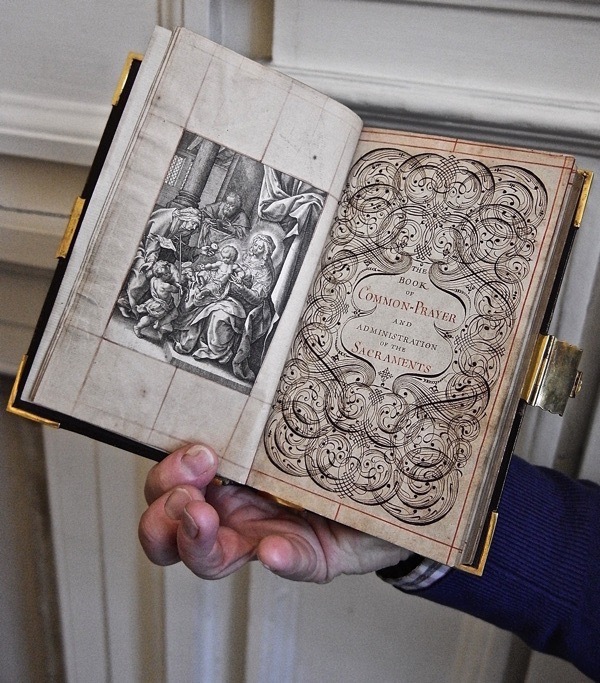 In the seventeenth century vestry room where a plaster angel presides solemnly from the ceiling, I was able to open Samuel Pepys’ prayer book. It was heart-stopping to turn the pages. Dark leather covers embossed with intricate designs enfold the volume, which he embellished with religious engravings and an elaborate hand-drawn calligraphic title page. 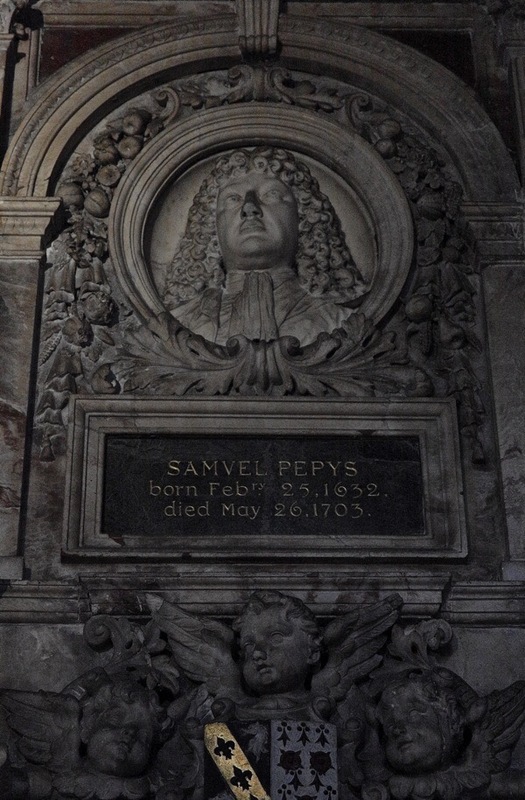 Samuel and Elizabeth Pepys are buried in a vault beneath the nave. 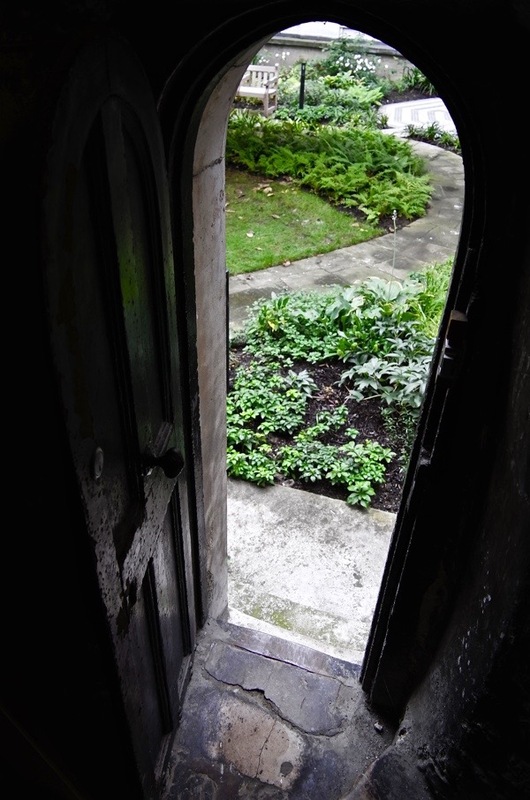 Within living memory, when the Victorian font was removed, a hole was exposed that led to a chamber with a passage that led to a hidden chapel where a tunnel was dug to reach the Pepys vault. Scholars would love to know if he was buried with his bladder stone upon its silver mount, but no investigation has yet been permitted. 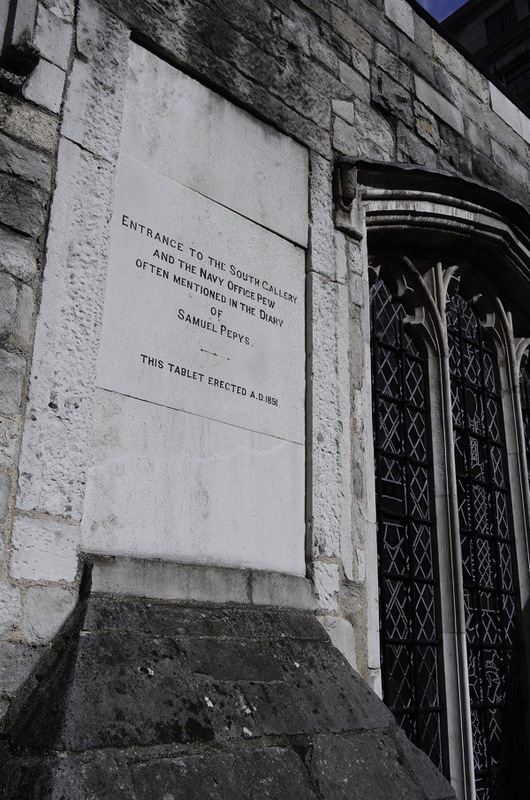 If you seek Samuel Pepys, St Olave’s is undoubtedly where you can find him. Walk in beneath the gate laden with skulls, across the graveyard bulging with the bodies of the long dead, cast your eyes along the flower beds for any shards of human bone, and enter the church where Samuel and Elizabeth regard each other from either side of the nave eternally. Thank you! 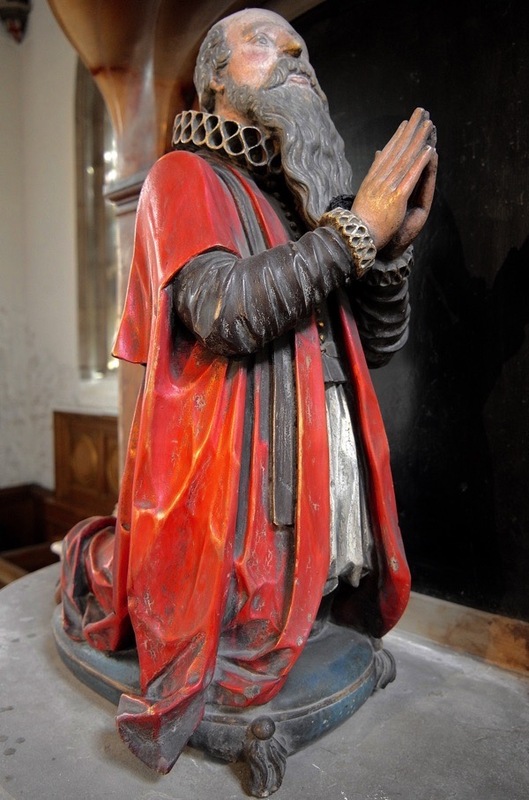 This week I lost all the photos I took at St Olave’s last October (cell phone malfunction; backup not done). Your photos are far superior to mine! I am impressed with how you managed in such tight spaces and appreciated the exterior photos that show how “tucked in” the church is. I, however, did have a short video of a choir practice, which was delightful. Writing to you from Seattle USA and as an online Pepys Diary reader (http://www.pepysdiary.com) and subsequent Pepys tourist. 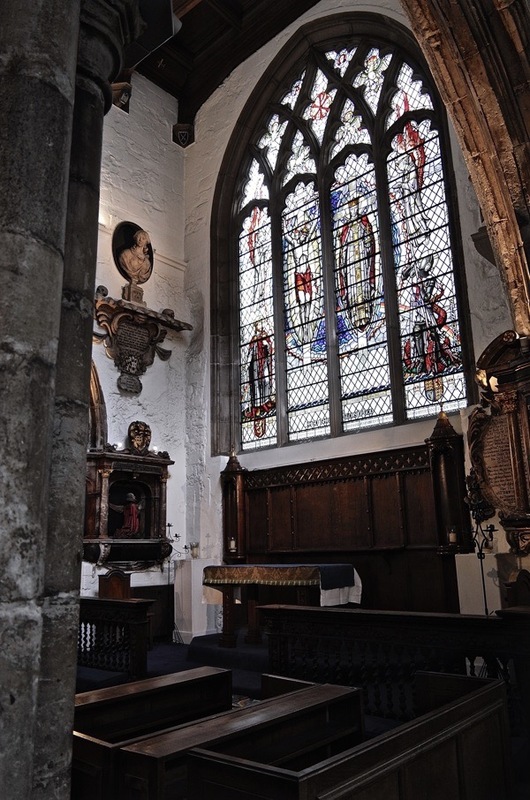 I am pleasantly surprised by your wonderful pictures of St. Olave’s. I will certainly visit the church during my next stay in London. Kindest regards from the Netherlands. 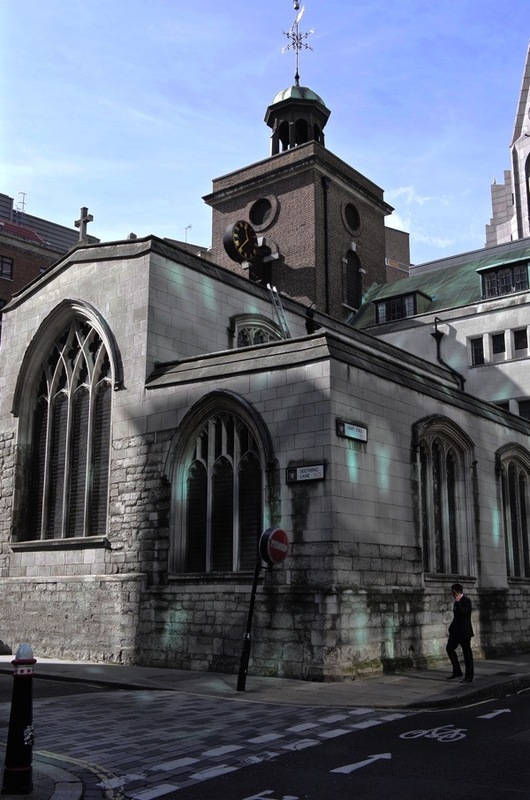 I love this; the few medieval churches in London provide a genuine link with Londoners of many centuries ago. I think it is to do with scale – so much of London is huge now that we forget the smaller city that must have existed pre-Fire. Something about the monuments is unbearably poignant. Lovely photos! Many thanks! I came to this via a posting from the Pepys diary online community (where I post as Australian Susan). 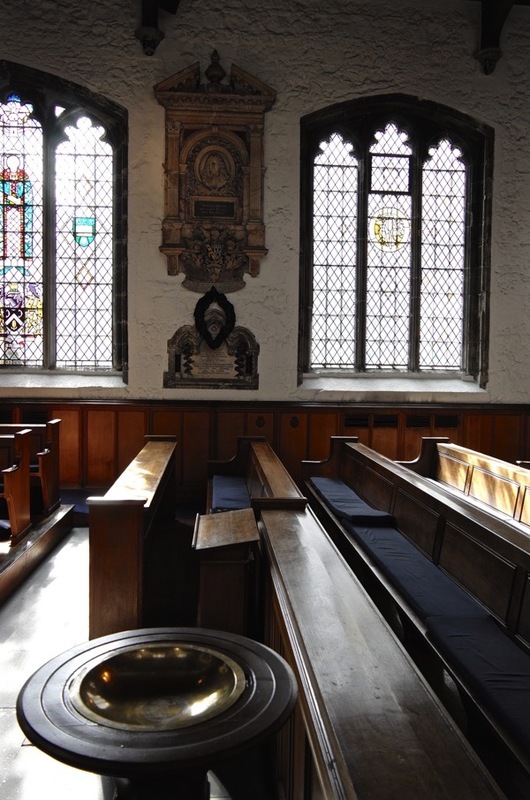 Wonderful to see such superior photos of this church, which was so integral to Pepys’s life (even if the gallery is long gone). So poignant to think of him looking from the gallery to the bust of his wife. 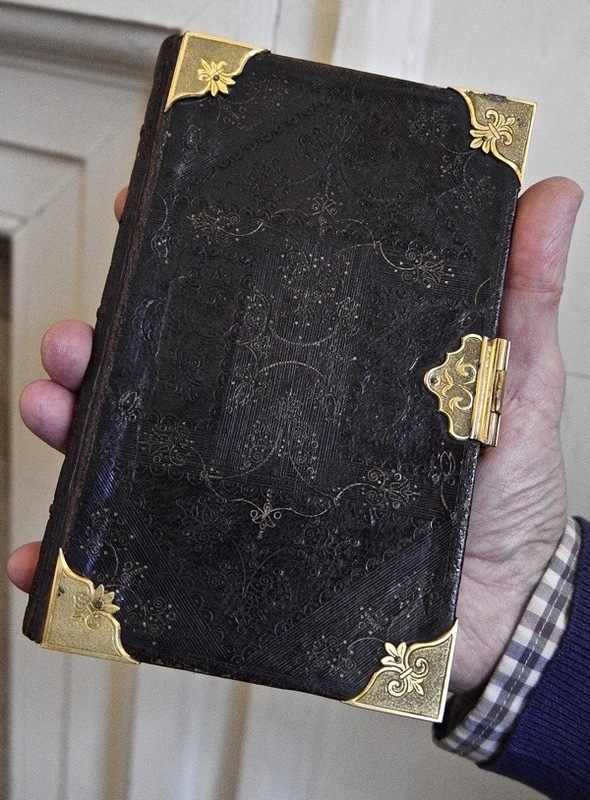 The librarian in me was horrified to think that people are allowed to handle such a precious artefact as Pepys’s Book of Common Prayer without white gloves on!! Please supply them!! I had not heard about the intriguing story of a tunnel being dug to the Pepys vault : more about this would be fascinating. Thanks again for the photos. I wish we had (and I could offer you) more information about the temporary passageway made in the 1930s through the rubble filling St Olave’s crypt. 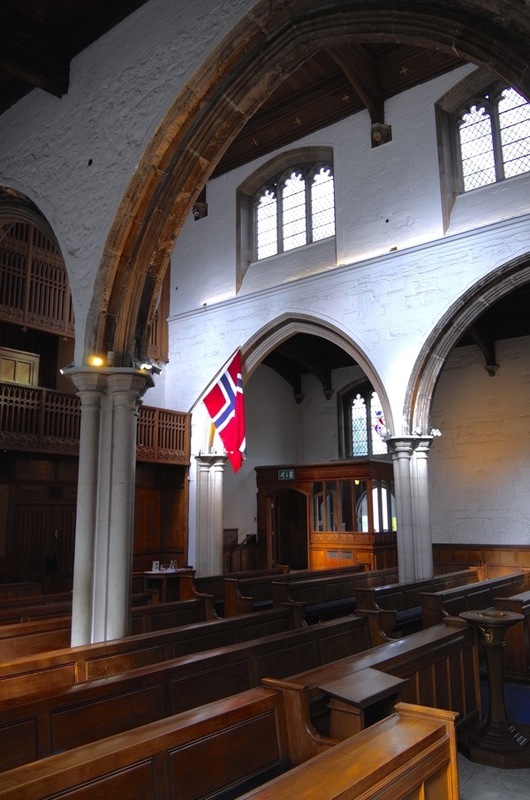 The opportunity to make the passage under the nave to the east end arose when the crypt chapel at the west end of the church was created. The crypt had been filled with rubble and closed off in the 1850s when the practice of intramural burial was discontinued by law. 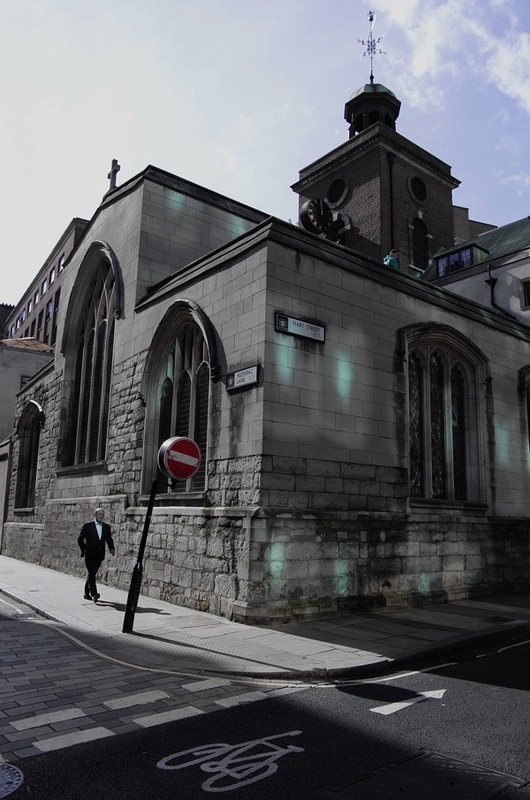 All the church records contain is a very short handwritten account by a woman who was able to make her way along the passageway where builders shone a torch into the Pepys burial site. As for white gloves, I can only plead in my defence that I have consulted a number of archivists, librarians and historians about the handling of the prayerbook and that the opinion in the UK is that, in the case of books, such gloves are at best unnecessary and at worst (if they encourage insensitive handling of a delicate artefact) harmful. As a Custodian of playwright George Bernard Shaw’s house Shaw’s Corner, of which Bernard Shaw bequeathed to the National Trust, on first glance I too was aghast seeing Samuel Pepys Prayer Book held without wearing the conservation gloves, but as (conservationist ) I did not wear gloves when displaying Bernard Shaw’s books to the public nor for photographic sessions for Television nor Magazenes etc. simply because this leant a more natural appeal for the viewer. I followed the instructions of Bernard Shaw himself whom did wish for his home and its contents to be viewed as that of a museum. The once a year cleaning of the hundreds of books Bernard Shaw loved, was a joy to behold and for this delicate operation I proudly covered my hands with the said little white gloves. 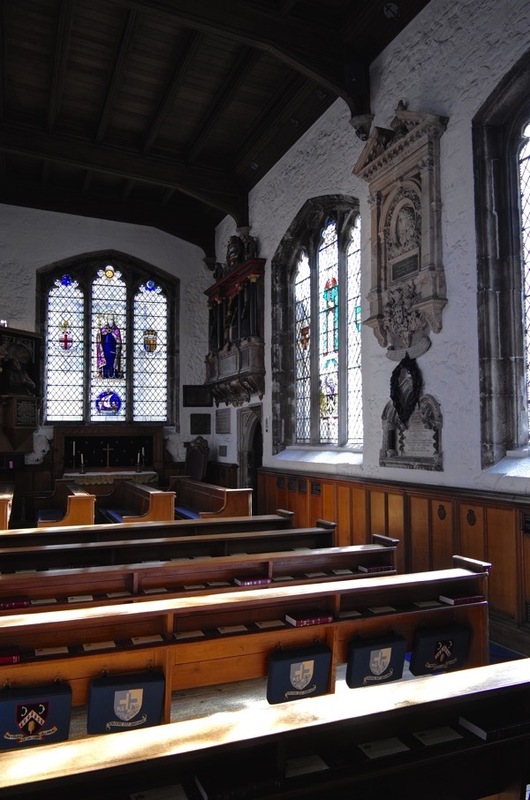 Gentle Author thank you for sharing these lovely photographs of the Church Samuel Pepys did love which I have visited several times in my pilgrimage of the fascinating Diarist. I have several 1st editions of Pepys Diaries and of Bernard Shaw which are conserved with the specialist of care for we as owners of books are only the Custodians of these treasures which hopefuly one day Custodians of Centuries to come will conserve for their future generations. I recall visiting St Olaves back in the 80′s and seeing a tiny museum in the crypt containing, among other things, a small baby’s shoe from the 18c I think, a baby of the parish was wearing when she fell from an upstairs window somewhere locally and survived. I wonder what became of the exhibits? The skulls over the entrance to the church yard was mentioned by Dickens in an essay or something of the like, just the sort of thing he had a yen for noticing.